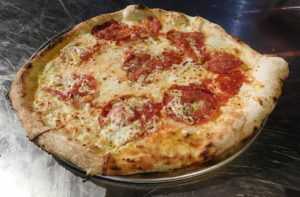 V Pizza, which opened last week in a prime spot in downtown Gainesville, has gone to great lengths to bring authentic Neapolitan-style pizza to town. All the way to Italy, in fact. Most everyone can agree that Gainesville has its share of pretty decent pizza joints. After all, this is a college town, where pizza plays an essential role at the top of many students’ food pyramid. Now we’re pleased to report that downtown Gainesville has a great pizza restaurant. A pepperoni pizza from V Pizza. V Pizza is the new guy on the block, and it’s a premium location at 115 SE 1st St., on the ground floor of the Hampton Inn in the large, open space formerly occupied by Vello’s. That’s because V Pizza uses only premium ingredients with no preservatives and chemicals. Better yet, the dough, cheese, tomato sauce and most other toppings have Italian connections. And everything the restaurant cooks, including piping-hot calzone and stromboli, is baked in massive wood-fired ovens made from clay molds and soil from the base of Mount Vesuvius. Yes, that Mount Vesuvius! Bartender Katie Renfro serves up a Trailer Park Pool Party. To prove his point, Asp served up one of Sidecar’s nine craft cocktails known as the Trailer Park Pool Party. The imaginative (and tangy) concoction includes High West Double Rye whiskey infused with Cap’n Crunch cereal, a Miller High Life cordial, Jerry Thomas Bitters, Bolivar Bitters and a twist of lemon. Asp pointed out that all Sidecar cocktails include fresh juices squeezed in-house everyday as well as syrups made by the bar staff. V Pizza and Sidecar are owned by Jacksonville business partners and long-time friends Kurt Rogers and Matt Carson. They already have three V Pizza locations in the Jacksonville area. The downtown Gainesville location is their first venture outside Duval County. Calkins added that V Pizza and Sidecar want to play an important role in the vitality of downtown Gainesville. “We really want to try and help all the businesses here and help drive business in the downtown area,” he said. 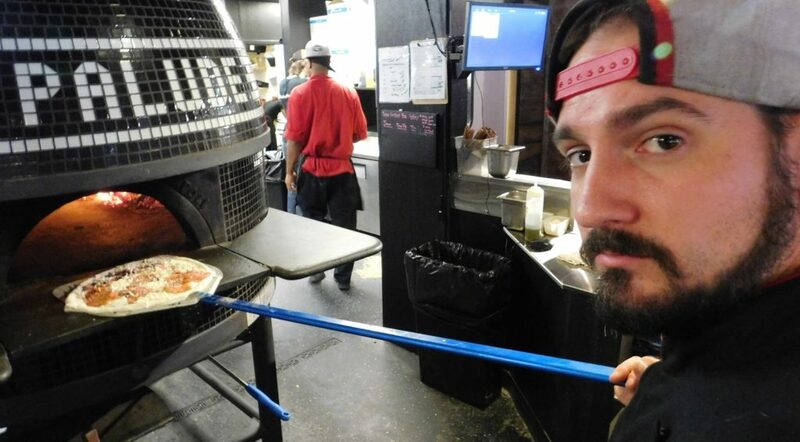 V Pizza’s other locations are considered “fast casual,” where customers order from a counter. The Gainesville eatery is fast-casual for lunch only. In the late afternoon and evening, V Pizza becomes a full-service restaurant. Day or night, however, the quality of pizza is the same. For starters, the restaurant uses pizza dough made fresh daily with highly refined type-00 flour imported from Italy and only four other ingredients: imported olive oil, live baker’s yeast, sea salt and RO (reverse osmosis) water. Next is mozzarella di bufala, a sublime cheese made exclusively from whole milk from the domestic Italian water buffalo. 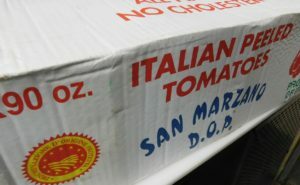 The pizza sauce is made from pureed San Marzano tomatoes imported from Naples, where they are cultivated in rich volcanic soil. 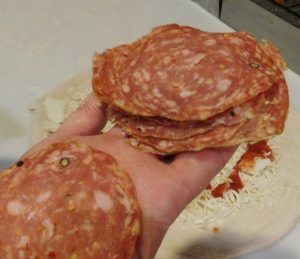 The pepperoni is actually soppressati, a premium dry salami also imported from Italy, and the sausage is authentic fontanini. V Pizza also uses gluten-free meatballs and only fresh vegetables, nothing from cans. Many items include homemade, basil-infused extra virgin olive oil. 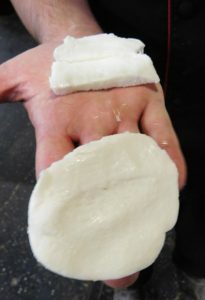 The dough and sauce are made without sugar or additives. Also, the pesto contains no pine nuts or parmesan cheese so that people with allergies or illnesses can eat without worries. 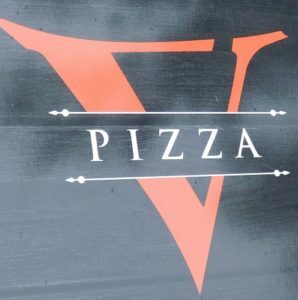 By the way, the “V” in V Pizza stands for veloce, which in Italian means “fast or quick.” Customers can expect their pizza to be ready in a matter of minutes because of the quick baking process. Matt Kepp slides a pizza into one of V Pizza’s two wood-fired ovens. 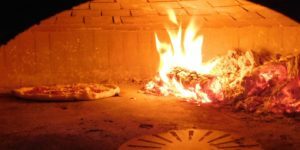 Kepp said that customers can also expect their pizzas to have a “slight smokiness” from the white oak used in the ovens as well as some char, which is normal. V Pizza promises that the finished pie will be crispy, tender and fragrant. A pizza bakes in 900-degree heat. Another difference is the way the pizzas are built, beginning with shredded mozzarella, then the sauce and then the toppings. 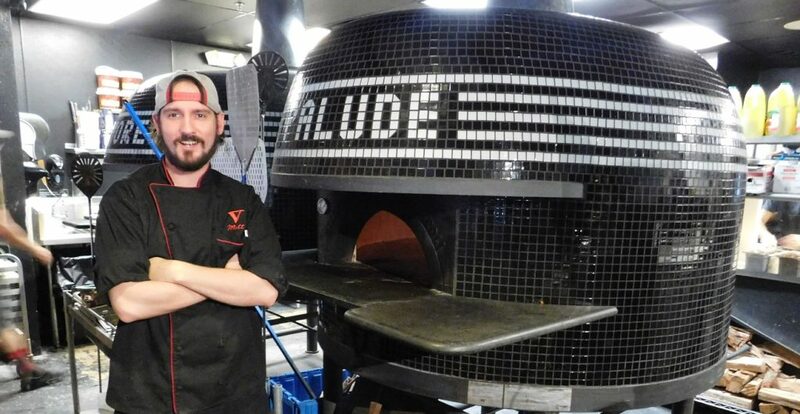 The two ovens at V Pizza were custom-made by Stefano Ferrara, a third-generation Neapolitan oven builder using Old World Neapolitan techniques and materials. The $20,000 ovens at the Gainesville location are named “Amore” and “La Palude,” which translates into “Love the Swamp” and pays homage to the hometown Gators. “Nobody has the ovens we have,” Kepp said with a hint of pride. The 12 varieties of pizza cost $14-$17 but build-your-own pies can cost as much as $23 loaded with ingredients. Lunch specials are $9.95 from 11 a.m.-3 p.m. seven days a week and include a beverage. 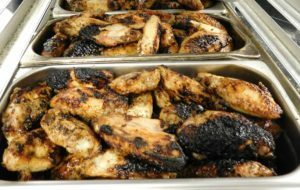 V Pizza also features two varieties of award-winning chicken wings, including one tossed in Calabrian chili pepper paste before being roasted in the wood oven. The menu also includes a selection of salads. For dessert, customers can choose from six varieties of authentic Italian gelato, cannolis, tiramisu and other sweets. Bartender Jim Asp and some of Sidecar’s whiskey selection. Meanwhile, Sidecar is always open for libations, including 12 beers on tap and a selection of about 100 whiskeys. 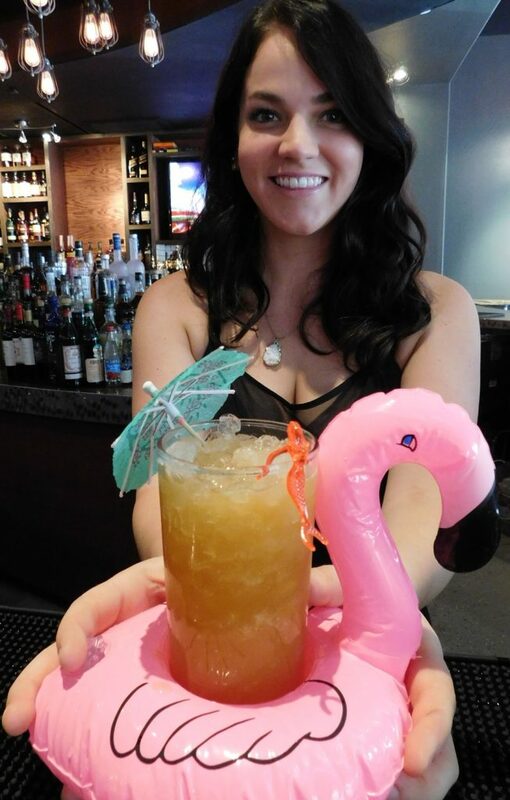 The bar is modeled after Sidecar in Jacksonville’s San Marco neighborhood as well as their “sister bar,” Flask & Cannon, on Jacksonville Beach. The emphasis is on cocktails, according to Calkins. 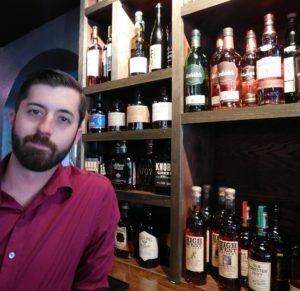 He wants Sidecar to complement, not to compete with, other area bars offering classic and craft cocktails. For further info, visit the V Pizza website.